Kenya’s voters are now eager for change. This year, Kenya celebrates fifty years of independence. In the life of nations and states, Kenya is young. Its new constitution, emerging out of and in response to struggle and bloodshed, including the postelection violence a mere five years ago, is even younger; it came into force in August 2010. 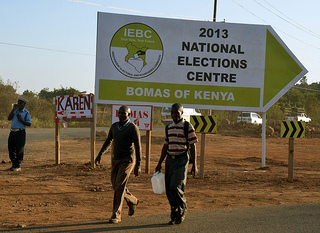 The election on March 4, 2013, was thus the first under a new legal order fashioned organically within Kenya (and not, like the last one, in Britain), and it ushered in two new bodies of government: a senate with powers to impeach a sitting president, and forty-seven county governments, which if devolution proceeds in accordance to the law, will control real resources. This reflects the overwhelming wish of the Kenyan people, who asked, in consultation after consultation over the last two decades, for the essentially colonial, centralized powers of the president to be curtailed. A key question now is can the newly created legal order that disperses and devolves power hold, and if so, what shape will it take? In the recent election, Kenyans and much of the world focused heavily on the race for the presidency. This is unsurprising, as the president as the symbolic head of state is still associated—perhaps incorrectly, given recent changes—with massive powers over the destiny of the country. More dramatically, the March 2013 election pitted Uhuru Kenyatta and Raila Odinga, two sons of Kenya’s most famous independence leaders (Jomo Kenyatta and Oginga Odinga), against each other in the run for the presidency. This evoked emotional memories of both Kenya’s brutal birth and the last painful election, which resulted in power sharing between Odinga and outgoing President Kibaki, after a highly irregular and violent election process in which the two candidates stood on opposite sides of the conflict. Perhaps because of this recent and painful past—and the related, uncomfortable questions about responsibility raised by the International Criminal Court (ICC) case as well as, more importantly, by the thousands of witnesses and victims—both presidential candidates made sure to emphasize Kenya’s bright future in their national campaigns, filling them with promises of development and transformation. In their English-language campaign advertisements in newspapers and on billboards, the candidates appeared next to pictures of highways and high-speed trains, giving a sense that Kenya was on the fast track forward—with the new constitution as its guide. Indeed, if we simply look at what these official campaigns were about by reading party manifestos, listening to the historic presidential debates, and perusing the English-language press, we would think the whole country was in agreement about what needs to be done: educate children, improve health care, support farmers, build better infrastructure, lower unemployment, raise wages, and nurture economic development, among other key actions. Yet today in postelection Kenya, we have a public that is deeply polarized—to the point that the new president, Uhuru Kenyatta, has called for reconciliation. One part of the country is celebrating the success of the Jubilee alliance led by Kenyatta. Another, often linked to Raila Odinga’s Coalition for Reform and Democracy (CORD) alliance, is in mourning, outraged, or stunned. Some are heralding the fact that, after the horrific postelection violence in 2007 and 2008, peace was maintained this time around, and that electoral disputes were and are being settled through the court system. In this universe, the fragile democratic institutions mandated by the progressive constitution of 2010 are working, and the many Kenyans who were persecuted and lost loved ones and property will now be protected (though historical justice is another matter). Businesses and property will be respected, and as a nation, Kenyans can now control their own destiny and stop listening to foreigners. Others are profoundly skeptical. So many questions remain about how the Independent Electoral and Boundaries Commission (IEBC) conducted the election, from the complete failure of the technology designed to curb rigging, to the many missing forms and discrepancies in tallying. So many critical questions remain about who controls the military and police; Kenya’s National Security Advisory Committee is primarily controlled by its Kikuyu members, who are of the same ethnicity as Kenyatta, and the old fears of surveillance and repression are reemerging, especially with what appeared to be concerted attacks against civil society in the media. The reality of having two International Criminal Court indictees leading the country is simply stunning. The elected Deputy President William Ruto, according to many commentators has distinguished himself by being a thug during the brutal reign of President Moi’s Kenya African National Union (KANU). There is an uneasy feeling that respect for institutions on the outside is accompanied by informal maneuverings on the inside, in the same way that the indictees appear to be respecting the ICC while, disturbingly, witnesses continue to disappear. At some level, the common denominator between the currently polarized political camps in Kenya and disagreements among the broader public is the constitution. The current leaders were elected—or selected depending on your viewpoint—from within the confines of the new legal order. All sides claim it as their source of legitimacy and as a yardstick of progress. The struggle to breathe life and meaning into that legal document is a common goal, for which Kenyans may find themselves bridging what looks like a hardened divide. Which Kenya will emerge from this ongoing conversation—a process historians might call nation building, messy in all places and times—is an open question. Perhaps it cannot be answered today, because an answer must be crafted through a longer process of struggle, negotiation, and imagination. Signs of change exist. Even now, as things seem to look the same in terms of the leadership at the highest levels, new forces are emerging. Governors across the country have just been confirmed but are already finding common cause, walking out of a meeting together after former President Kibaki lectured to them about Kenya being a “unitary state.” The election produced a Somali-Kenyan MP in Luo-dominated Nyanza province, and an Asian Kenyan MP in Meru. Nairobi, the powerhouse of the Kenyan economy, has a technocratic CORD governor and a populist Jubilee senator. A forensic audit of the IEBC’s performance one way or another will occur, and the emerging discussion of judicial activism suggests that the Supreme Court will become a new arena of struggle in this battle to shape the nation. [i] The new Environment and Land Courts have not even begun their work dissecting and deliberating over the accumulated land injustices across the country. The National Land Commission, deliberately stalled by the previous administration, has not yet come into force but must, according to the new constitution, opening new arenas for settling vexing issues. Despite the limited court interpretation of the constitution’s gender clause for this election, Kenyans will see more women in Parliament. Lastly, as the president and his coterie now start to name the appointees to a constitutionally limited cabinet, they will need to consider whether these nominees will pass the scrutiny of Parliament, which will now vet each candidate. And so the struggle is just beginning under new, untested rules. No doubt old dirty tricks will be tried (as they continue to be in all democracies), but now more tools exist to fight them. The outcome depends on popular mobilization and people exercising their rights like the muscles of an athlete. Politics, too, can be seen as a marathon, and Kenyans have distinguished themselves in the sport. Overall, Kenya and its partners—the East African region, which depends on Kenya as an economic powerhouse and as a buffer against political conflicts elsewhere, especially in Somalia; the United States, which relies on Kenya in its war on terror;[iv] Europe, Kenya’s largest trading partner; and China, its newest one—can breathe a collective sigh of relief that the election was peaceful if imperfect. The real struggle for the Kenyan nation, its democracy, and its constitutional order is just beginning and is bound to be messy and difficult if history is any indicator. [v] This is especially the case since Kenya’s struggle is occurring in the context of the ICC cases, the war on terror, the related war in Somalia, and discoveries of oil in Kenya and the wider region. Still, in no place and time has this process of transformation been easy, nor is it ever finished. Kenya at fifty is only at the doorstep of its future. [i] In a ruling shortly after the election, the Supreme Court deemed the minster of education’s attempt to ban a high school play that highlights ethnic favoritism and corruption unconstitutional. The play was recently performed and can be viewed on Youtube: http://www.youtube.com/watch?v=jlX2HQgOMSU. [ii] George Lakoff, The Political Mind (New York: Viking Press, 2008), 197. [iii] As of this posting, Deputy President William Ruto’s case is set to begin May 28, 2013, while President Kenyatta will stand trail starting July 9, 2013. [iv] Kenya is one of the largest recipients of US aid for counterterrorism, and the war it is waging in Somalia is no doubt linked to this, although shockingly it never came up as an election issue. [v] See John Lonsdale’s brilliant work on this matter, particularly his chapter “Anti-Colonial Nationalism and Patriotism in Sub-Saharan Africa,” in The Oxford Handbook of the History of Nationalism, ed. John Breuilly (Oxford: Oxford University Press, 2013), 318-340. This article is not only highly speculative, but clearly borders on the whimsically libelous, sensational, one-sided and indeed highly false view of contemporary Kenya today. To sensationally claim that, “the reality of having two International Criminal Court indictees leading the country is simply stunning” is rehashing of the navel gazing of Western liberal do-gooders and civil society entrepreneurs who would like to paint a picture of repression in Kenya to satisfy their insatiable greed for donor funding and fodder for their research material. What is most injurous and borders on libel is the following, “the elected Vice President William Ruto, according to many commentators has distinguished himself by being a thug during the brutal reign of President Moi’s Kenya African National Union (KANU)”. Pray tell on what basis the use of the word “thug” is applied in this case? What acts of commission or omission give the author the moral ground to call an African leader a “thug” just because they do not agree with their poltical views? Kenya has changed in fundamental ways and one of the most important shifts is that we do not need any more lectures from the West. At our 50th year, we are free country. Free to vote the leaders of our choosing, no matter how “stunning” it may be in some quarters. Free to chose our international partners and free to run our affairs. This article hankers for a prescription for Kenya that clearly exists in the mind of a foreigner with no stake in our future.